Today we have mystery author Lynne Raimondo as our guest, and this is a real treat: She’s going to tell us a story! Yes, yes, it has implications for writing what’s “believable,” and it’s a writing lesson–but also A STORY. Lynne is the author of the mystery DANTE’S WOOD, called “taut, compelling, and very moving” by Louise Penny(! 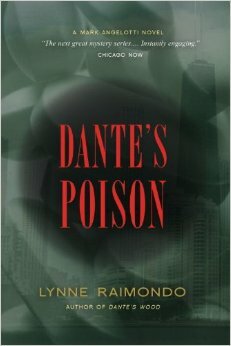 ), and the follow-up, DANTE’S POISON, out May 6th from Seventh Street Books. Lynne has had some exciting times off the page as an attorney, but now she lets her series protagonist, Mark Angelotti, have most of the thrilling adventures. Settle in (not next to the fireplace—you’ll see why in a minute) and enjoy. For me, one of the hardest things about writing is suspending my own disbelief. I tend to be a literal person. On right-brain, left-brain tests I always score high on logic and low on creativity. It stood me well when I was a practicing lawyer, but it’s a hindrance in my second career as a writer. I’m always standing outside my work, questioning whether it makes any sense, and condemning my flights of fancy as unrealistic, if not downright silly. When I’m in this frame of mind, it helps to be reminded of an event in my own life that sounds completely made up, but really happened. I’ll tell you the story and you can decide for yourself what it means. It was December 1999, just two weeks before the new millennium. At the time, I was working as an in-house lawyer for a big accounting firm, and everyone in the office was consumed with the impending Y2K crisis. (Funny how that one never materialized.) I’d been working overtime for weeks, and I arrived home late one Friday evening to three young children starved for food and a mother’s attention. It was also the last night of Chanukah. My husband was out of town on a business trip and not scheduled to arrive home for several hours. I fried latkes for the kids, and we lit the candles. Afterward, my eldest entertained us on the piano with a song she’d been practicing all day, a haunting tune about candles burning brightly in a window. I settled my older two in front of a television show and took my youngest upstairs for a bath. I need to stop here and explain a few things. Our house then and now was a three-story, wood Victorian built in 1895. As was the custom in those days, the workers had filled the space between its inner and outer walls with newspaper. The prior owners had replaced very little of this antique insulation, though they’d installed a modern master bathroom, with a gas fireplace and a big whirlpool tub. Naturally, the tub was a huge hit with my kids, so this is where I brought my daughter. I drew a bath for her and lit a fire, and we played games until she tired of the water. When she was toweled off and in her pajamas, I dried and combed out her hair on the rug. We were both exhausted and soon sleeping soundly on the floor. Around 9:30 p.m., I woke up to find the gas fire still on. I’d left it burning longer than usual, but wasn’t worried: it had been inspected and declared safe before we moved in. I turned it off and carried my daughter to her bedroom on the third floor. My older two children, accustomed to a narcoleptic working mother, had already put themselves to bed. I dragged myself to my own bed and fell promptly back to sleep. Not long after, my husband came home and fell asleep too, downstairs in front of the television. Around midnight, our fire alarm went off. At first, my husband and I were confused. We collided like Keystone Kops on the second floor landing, where the alarm was doing its loudest beeping. There was smoke everywhere, but we couldn’t find the source. While we were scratching our heads, a painting above the fireplace where my daughter and I had been napping burst suddenly into flame. My husband tore it off the wall and threw it into the tub. A large heat blister puckered the wall behind it. Almost at the same time, our doorbell began ringing. A man outside was shouting at us to get out. Our roof was in flames, from one end to the other. My husband and I sprang into action. We gathered up the kids, still half-asleep and clinging to their stuffed animals, and rushed them down the street to a neighbor’s house. Once they were out of harm’s way, we returned to watch, shivering in pajamas and coats on the sidewalk while the fire raged before us, seemingly out of control. More neighbors came and shared our vigil, bringing blankets and hot cocoa. Around 3 a.m., the firefighters asked if there was anything they should try to save, as it looked like the house and everything in it would be reduced to ashes by morning. Minutes later, the roof collapsed in a rain of sparks, lighting up the sky for blocks around. Tears stung my eyes when I saw the destruction, not realizing that it was a godsend. The breach allowed the firefighters to douse the hottest part of the fire from above with a cherry picker. Thanks to their heroic efforts, the worst never happened, though the damage was extensive and the majority of our possessions were destroyed. Investigation later revealed that the gas fireplace had been installed improperly. A chink in the fire box had allowed the heat to escape the flue and travel to the inner walls, where all that hundred-year-old newspaper was waiting. So where is this going, you ask? It’s a good story, but what does it have to do with the craft of writing fiction? Well, here it is. The next morning, while we were picking through the charred and sodden debris, we came upon something that still sends a shiver down my spine. Before the fire, in one of the rooms nearest the ill-fated fireplace, there was a second piece of artwork, bequeathed to us by my mother-in-law when she passed away from cancer. It was one of her most cherished possessions: a signed Ben Shahn print depicting a Chanukah menorah, a joyous work in blue, purple, and gold that still hangs in our home today. Somehow it had slipped to the floor during the fire and landed behind a section of drywall, where it escaped both the flames and the deluge of water rained down upon it later. Though everything else around it was destroyed, it alone remained intact and in almost perfect condition. Are you seeing the symbolism here? On the last night of Chanukah, in the final year of the old millennium, a house burned brightly through the night and one of the few objects to survive was a representation of a menorah. God’s work? Or my mother-in-law’s? Or just plain coincidence? You be the judge. But if you are like me and are sometimes inclined to doubt the realism of your fiction, pick up a newspaper now and again. Stories like mine aren’t all that unheard of. And if it can happen in real life, it can happen in your novel. You can trust Lynne for a good story, that’s for sure. Anyone else have an unbelievable story from real life? GIVEAWAY! Comment on this post by noon EST on Friday, April 18, and you’ll be entered to win a copy of DANTE’S WOOD. U.S. addresses only, please. Follow The Debutante Ball on Facebook and Twitter for extra entries—just mention that you did so in your comments. We’ll choose and contact the winner on Friday. Good luck! 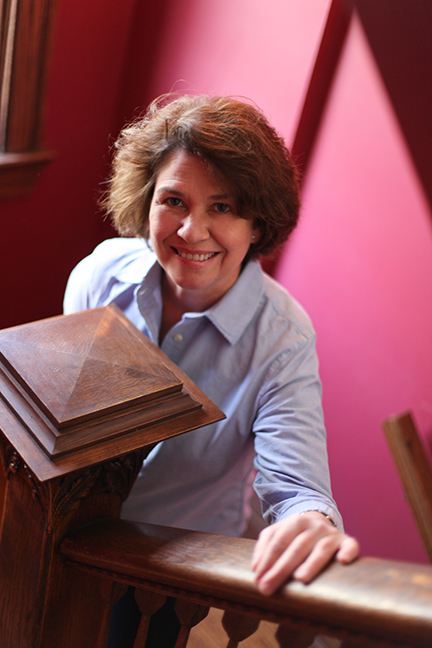 Lynne Raimondo is the author of Dante’s Wood (Seventh Street Books, 2013). “Stunning” and “one of the best mystery debuts since V.I. Warshawsky solved her first case.”—Mystery Scene. “A real keeper.” – Library Journal (starred review and mystery debut of the month). Before turning to writing, Lynne was a partner at a major Chicago law firm, the general counsel of Arthur Andersen, LLP, and the general counsel of the Illinois Department of Revenue. Dante’s Poison, the next in her series featuring a blind forensic psychiatrist, will be released in May 2014. Visit her website at http://lynneraimondo.com. What an amazing story. So glad everyone was okay. Thank you for sharing it with us today at the Ball. I came across your lovely blog today. Interesting story. What an amazing story, Lynne! How fortunate you all were to have survived such an ordeal. By losing everything, almost, you gained strength in ways you probably could never have imaged. Good luck with your new book, the first was fabulous! Thanks Daco — we did really learn a lot about how little possessions mean in the grand scheme of things! Next time I’m at your house, Lynne, I want to see that painting! What a great story. We’re going to include some discussion of this believability issue in our Printers Row panel! Thanks for being our guest this week! And thank you, Lori! It’s a privilege to be on the blog today! Lynne! So great to have you hear today. Wow. Stories like that make me shiver. Life is so unbelievable sometimes. That whole “life is stranger than fiction” thing, right? Lynne, this is a lovely story–and in the reading of it, it’s easy to see your riveting style of writing.. Although I am ridiculously right-brained, I, too, am obsessed with making stories believable. But having edited a book of stories about the 1990 Oakland firestorm I know there are many unlikely stories that are true. Terry — where can I find that book about Oakland? Wow! What a great story Lynne! I definitely do believe in divine intervention, and know that not only were you & your family saved by that, but your treasured piece from your mother-in-law holds her spirit and she will always be with you as long as you own, enjoy, and display it with love, in her memory. What a great story. Thank you..
There’s a fair amount of magical realism in my writing, and (as far as I know) nobody has ever had trouble accepting it. Where I’ve received questions and disagreements has always been about motivation. I have a character who is omnipotent and omniscient, and everybody has been fine with that, but when you get into WHY she does or doesn’t do things — that’s when there are questions. Based on things I’ve read about the last Superman movie (which I didn’t see), people have no trouble believing that Superman can fly – but they can get very worked up about whether he would ever kill. What an incredible story! I’m so sorry you lost so much. 🙁 Yet, I love how you turned your tragedy (and thank God the kids were safe!!! ), into a writing metaphor. Lovely post and your book sounds really great. Wow, I got chills reading this, Lynne. Thanks so much for sharing with us! I’m so glad you and your family made it out safely. Like you, I struggle a lot with suspension of disbelief when I’m writing. It’s why it often takes me so long to feel like I want to pursue a story. I may toy with 7 or 8 before even deciding on one that feels true. And usually what convinces me is some tie to the real world (even if it’s a bizarre tie). Thanks to everyone who commented! To Anthony’s point, I do think readers get much more worked up over character than plot. Maybe it’s because they’re already primed for suspension of disbelief when they pick up a work that’s clearly designated fiction. But to identify with the character in a story they have to respect or at least understand that character’s actions. My protagonist is a pretty flawed guy and he’s not going to be everyone’s cup of tea, but I work very hard at making him as believable as I can. SUCH great points about suspension of disbelief in character vs plot, Anthony & Lynne.